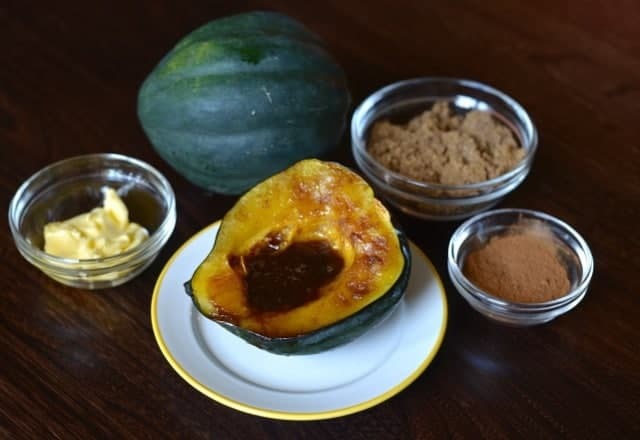 This candied acorn squash is a real treat, I will show you how to make this under 20 minutes, this is microwaved, and then popped under the broiler with a butter sauce where I have added pumpkin pie spice. Perhaps you have seen this squash in the grocery store. My inspiration for this recipe came from a lady who I was standing next to in the check out line at the grocery store. She had asked me how do you cook one of those. She was older than me, and I asked had she ever tried one before. She said no. So I told her how she would cook the acorn squash. I personally love these, nothing says fall to me like the wonderful squash and pumpkin that come into season. The one thing I have disliked about Acorn squash is that it can take a long time to cook if you want to bake it. It will take a little over an hour. So I was reading one of my new cookbooks and Cooks Illustrated suggested microwaving the squash and then popping it under the broiler, and you know what, it worked. It worked wonderfully. Actually I was amazed at their suggestion because this meant you can have an acorn squash in a reasonable amount of time. To this recipe, I added a little touch of pumpkin pie spice because I thought this would be great with a little bit of cinnamon and nutmeg. Pumpkin pie spice has both cinnamon and nutmeg and this turned this squash into a real delight. So now that you can prepare this in less than 30 minutes there is no reason why you can’t have some acorn squash during the week. Look for the acorn squash that is free of blemishes and soft spots. The squash is ripe when it is dark green. A rind that is shiny can mean that the fruit was picked before it was fully ripe. The squash should be stored in a single layer and should not be stacked on top of one another. The squash can be stored at room temperature and can be stored for up to three months in a dark area. Love acorn squash? Be sure to check out these acorn squash recipes. Acorn squash never tasted so good. Acorn squash is baked in the oven with butter, brown sugar, and cinnamon. Use a heavy knife and cut the squash in half from the stem the end of the squash. Use a spoon to scoop out the seeds and the stringy bits from the squash. Discard the seeds and stringy bits. Place the squash cut side down in a baking dish. Add 1/2 cup of water to the dish and then microwave the squash for 15 to 20 minutes. The squash will be done when you can pierce the fruit with a fork. The fork should pierce the squash easily. Place your oven on broil. Melt the butter and stir in brown sugar, pumpkin pie spice, and salt. When the squash has cooked in the microwave place the squash on an ovenproof dish, and drizzle butter sauce over the squash. Place the squash under the broiler and broil for 5 to 7 minutes, the butter will begin to bubble and the brown sugar will begin to caramelize. Serve immediately. This soup is oh so creamy.